Here are some of the nearest located golf clubs in the area. Atalaya was created back in 1968 before the rash of golf urbanisation development on the Costa del Sol. Set against the stunning backdrop of the Sierra Blanca mountains, its two magnificent 18-hole courses - the Atalaya Old Course and the Atalaya New Course - are lined with mature eucalyptus trees, cactus and palms and pink and white azaleas. This 18-hole golf course is spectacularly located and captivatingly beautiful and it inspires the utmost respect and admiration in golfers from around the world. Many of them are drawn back, time and again, in a determined effort to conquer this amazing course. Few succeed, but playing Monte Mayor is an experience no one will ever forget. It is widely acknowledged as one of Europe's premier golfing experiences. In its short history, Flamingos Golf Club has already attained well-deserved international renown for the high level of quality it offers and for having been, for three consecutive years, the venue for the European Senior' Final, 'The Daily Telegraph European Seniors' Match Play Championship'. 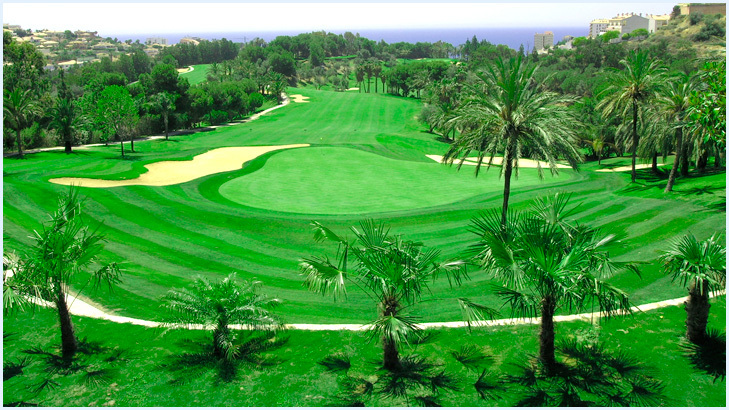 The Marbella Club Hotel Golf Resort is a world class golf course that exceeds even the highest expectations. The in-house British P.G.A. Professional, Gary Vaulter, has extensive experience teaching all aspects of the game at all levels of ability, and is available to answer your queries, upon request, several times a week. As the designer himself says, Los Arqueros is a good course for players of all kinds - a reasonable challenge for the average golfer and a tough test for professionals. It is set among the mountains of the Sierra de Ronda, and has an original layout in beautiful surroundings. La Quinta Golf has three 9 hole courses integrated in the natural surroundings of the area, from which one can view the Mediterranean sea and the mountains that encircle Marbella Golf Valley, whilst playing one of its 3 possible courses. Los Naranjos is one of Spains best golf courses. World famous golf course architect Robert Trent Jones Sr. considered it one of his finest European designs and it is indeed a true Championship course. Voted "Golf Club of the Year" in 2008. Guadalmina offers two 18 holes golf courses and a par 3 nine holes golf course, a covered driving range for 40 players and a chipping and putting green. Everywhere you look the views are magnificent, from many holes you can see the blue of the mediterranean and there is always the backdrop of the dramatic mountains. The clubhouse sits in the heart of the course, looking onto the 18th green and was created out of a number of country "casitas" giving it an intimate and friendly ambience helped by the attentive service of the "camareros".